RSI Indicator: Bullish Divergence | TRADEPRO Academy | Day trading and swing trading like a pro. The Relative Strength Indicator, or commonly known as the RSI is an oscillating technical indicator. Used in the technical analysis of financial markets. The basis of the RSI is that it measures a financial instruments strength or weakness based on its closing prices for a specific period. The extremes of the indicator are 0 and 100. RSI oscillates between two levels, which can be altered based on preference. However, the default setting are 30 (bottom threshold) and 70 (upper threshold). When the RSI presses above and through the 70 mark the instrument in question is considered overbought. On the other hand when the indicator measures 30 and lower, the asset is considered oversold. The RSI is often used for discrepancies of divergences in relation to the underlying asset. We can divide the divergences we see using the RSI and price action into two groups. Bearish divergence and bullish divergence. Today we’ll be focusing on bullish divergence. Bullish divergence in the RSI can be further divided into regular divergence and hidden divergence. The premise of bullish divergence is that the oscillator acts differently than price action. Regular bullish divergence is an increase in the RSI indicator while the price itself descends. When this type of divergence is spotted one can look to purchase the underlying product. Done once it retraces into another support level that the trader has outlined. It is important that one sees the RSI in the oversold territory as this divergence begins to form, which indicates an opportunity to enter into a long position. Below we’ve got an example of a regular bullish divergence. This is an example of Dynagas LNG stock, in which you can see a clear downtrend that is met by oversold RSI. Higher lows form on the RSI as the stock price decreases. This divergence leads to a pop in the stock just after the RSI moves out of oversold territory. Hidden bullish divergence is still a divergence between price action and the indicator. In this situation, the RSI prints lower lows while price prints higher lows. Again one would look for a retrace into a support level to identify a long. In a hidden divergence situation, the trader wants to see the RSI drop into the oversold territory as it prints lower lows, hinting to a buy signal. Below we have an example of Gold (US$/OZ). This is a weekly chart that shows bearish RSI while price increases. This hints at more potential upside for the commodity off the support level. 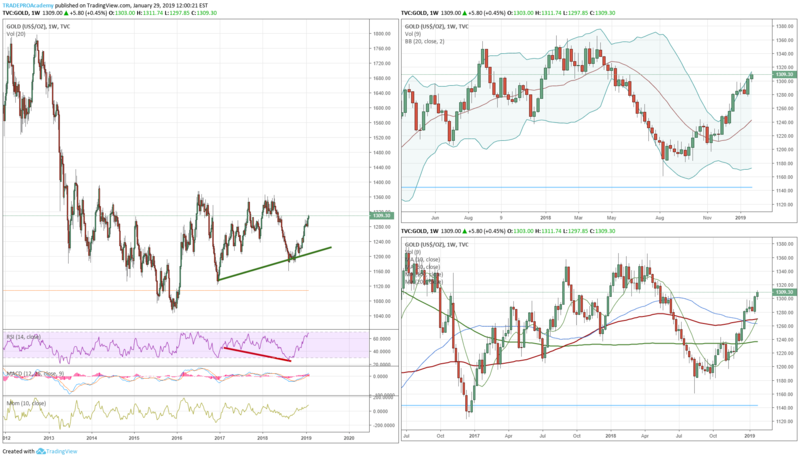 GOLD (US$/OZ) Hidden bullish divergence. Using bullish RSI divergence can be a powerful tool in ones arsenal. The divergence does not occur as often as one would think, but when a trader spots it, the tool can be profitable. The fact that it is difficult to spot makes the bullish divergence great. Try and find some bullish divergence in your favorite stocks!